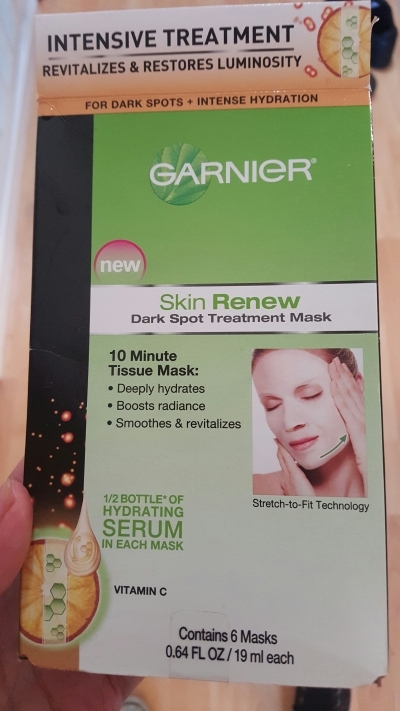 Garnier’s skin renew face mask is labeled as a dark spot correcter, but it also says it will help boost radiance, as well as smooth and hydrate dull skin. I normally go for face masks that you slather on your face, wait for it to harden, and wash away. But I saw this six pack mask set on sale for about $6 and thought it would be fun to try them out. Currently they sell for about $15 at Target, Ulta and other drugstores. As mentioned, the box comes with six masks, and it is recommended to use them three times a week for optimal results. So let’s see if these things work, shall we?! You start with a clean and dry face, then apply the cloth mask, which is saturated with serum so it will stay put. Application is very simple, just take out a mask match the eye and mouth holes to your face and gently press it on. Be sure to press all around the edges of your face and around your nose. Use the serum that is left on your hands from applying the mask on your neck. Then leave it on for ten minutes to let the mask do its magic. Once time is up, take off the mask, and rub any left over serum into your face. After my first mask, my face did feel very soft. Not sure if it looked brighter, but the moisture from the serum extended well through the next day. After using the serum mask three days the first week, I did notice a difference. My skin looked a little brighter, and my skin tone was a little even. It looked as though some freckles and marks had started to fade away. After that first week, I stopped wearing concealer, and even blush! I guess brighter looking skin makes not wearing makeupÂ an option. And here I am two weeks of using Garnier’s face mask, andÂ I still have avoided spending as much time as I used to on my makeup. LiterallyÂ shaping my brows, andÂ applying some mascara has been my routine these couple weeks. I used to love contouring my cheeks and adding some blush; but since I started using these masks I feel as though my skin looks dewy. I haven’t had breakouts, which helps avoiding concealer. Overall, I liked these masks and will definitely be buying another pack. In two weeks, I have noticed a change on my face. Specifically, a more even tone on my cheeks, a natural dewy look, and I’ve noticed those white oil bumps ( or milia to be more precise) have diminished as well. Overall, I believe Garnier makes pretty decent products at pretty affordable prices. I wasÂ really surprised at how well these masks worked, especially since I am so used to my clay masks. The $15 might seem a bit steep for a box ofÂ six masks, when compared to a big old tube or jar of clay; but the product is completely different. On top of that, these little masks have showed greater results, than I have ever seen with a clay mask. The fact each mask is super drenched in serum, is a superÂ plus when it comes to Garnier’s masks as opposed to clay masks which might require lotion or serum to keep your skin soft post-application. If you are considering trying them out, I would say go for it. If you already have tried them out, how did they work out for you? I have combination skin, oily on certain parts (mostly t-zone) and dry around my cheeks and sometimes nose. And since we all have different skin types, I’d like to see how they worked for others. Share your own experience, or links to your personal blog reviews below for others to see.